Citation Information: J Clin Invest. 2017;127(7):2777-2788. https://doi.org/10.1172/JCI92958. NK cells are highly efficient at preventing cancer metastasis but are infrequently found in the core of primary tumors. Here, have we demonstrated that freshly isolated mouse and human NK cells express low levels of the endo-β-D-glucuronidase heparanase that increase upon NK cell activation. Heparanase deficiency did not affect development, differentiation, or tissue localization of NK cells under steady-state conditions. However, mice lacking heparanase specifically in NK cells (Hpsefl/fl NKp46-iCre mice) were highly tumor prone when challenged with the carcinogen methylcholanthrene (MCA). Hpsefl/fl NKp46-iCre mice were also more susceptible to tumor growth than were their littermate controls when challenged with the established mouse lymphoma cell line RMA-S-RAE-1β, which overexpresses the NK cell group 2D (NKG2D) ligand RAE-1β, or when inoculated with metastatic melanoma, prostate carcinoma, or mammary carcinoma cell lines. NK cell invasion of primary tumors and recruitment to the site of metastasis were strictly dependent on the presence of heparanase. Cytokine and immune checkpoint blockade immunotherapy for metastases was compromised when NK cells lacked heparanase. Our data suggest that heparanase plays a critical role in NK cell invasion into tumors and thereby tumor progression and metastases. This should be considered when systemically treating cancer patients with heparanase inhibitors, since the potential adverse effect on NK cell infiltration might limit the antitumor activity of the inhibitors. 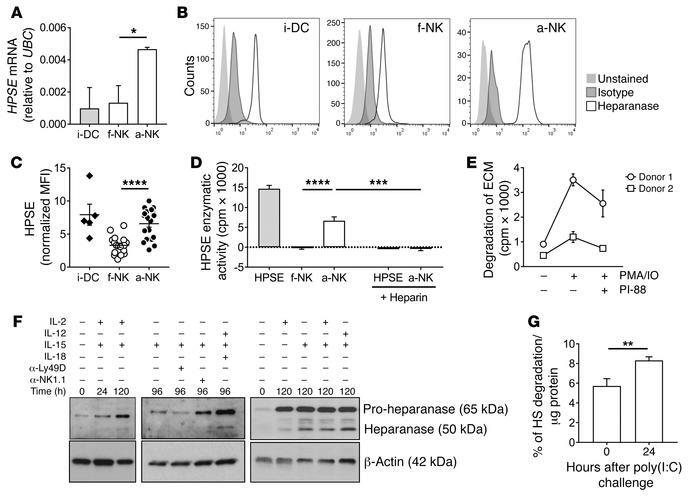 Activated NK cells express enzymatically active heparanase. (A–E) NK cells isolated from human donors were assayed as f-NK or a-NK cells. i-DCs were included as a control. (A) mRNA expression of HPSE relative to UBC was assessed by quantitative PCR (qPCR) (mean ± SD; n = 3 individual donors; 1 representative experiment of 2 experiments). (B and C) Heparanase protein expression was determined by intracellular staining and flow cytometry (mean ± SEM; n = 5–13 donors per group). MFI, mean fluorescence intensity. (D) HPSE enzymatic activity was determined by incubating 2 × 105 f-NK or a-NK cells with 3H-HS for 16 hours ± 1 U heparin. Human platelet heparanase (2.5 ng) was included as a control (mean ± SEM; n = 4–11 per group; data were pooled from 2 independent experiments). (E) a-NK cells (2 × 106) from 2 individual donors were cultured on 35S-ECM plates ± 2 ng/ml PMA/0.1 μM ionomycin (IO) ± 200 μg/ml PI-88. ECM degradation was measured after 20 hours (mean ± SD; n = 3 technical replicates; data are representative of 5 individual donors). (F) Heparanase expression was analyzed by Western blotting. FACS-purified mouse TCRβ–NK1.1+NKp46+DX5+ NK cells were analyzed ex vivo or after stimulation for the indicated durations by cytokines (500 U/ml IL-2, 1 ng/ml IL-12, 10 ng/ml IL-15, and 10 ng/ml IL-18) or by NK cell receptor cross-linking (α-Ly49D or α-NK1.1). (G) The enzymatic activity of heparanase was determined by a TR-FRET–based HS degradation assay. Splenic NK cells were isolated by negative depletion from WT mice that had been injected with 250 μg poly(I:C) 24 hours prior to the analysis or were left untreated (mean ± SD; n = 3). Statistically significant differences between the groups were determined by 1-way ANOVA with Tukey’s post test (A, C, and D) or unpaired Student’s t test (G). *P < 0.05, **P < 0.01, ***P < 0.001, and ****P < 0.0001.